Prepare cake batter and bake in 13x9-inch baking pan as directed on package. Cool in pan 15 min. Invert cake onto wire rack; remove pan. Cool cake completely. 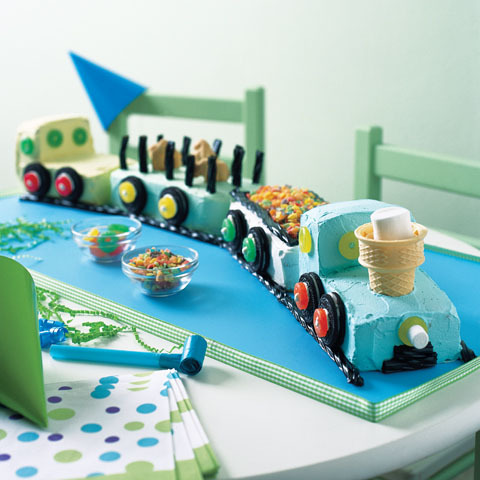 Transfer cake to large platter or cake board. Tint whipped topping with food coloring to desired shade of green; spread onto top and sides of cake. 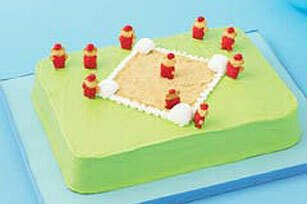 Sprinkle wafer crumbs in diamond shape in center of cake to resemble a baseball infield. 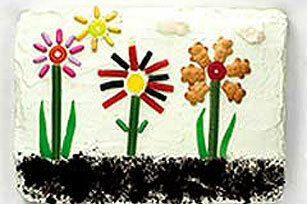 Draw base lines with the white icing. Add a marshmallow piece for home plate and for each base. 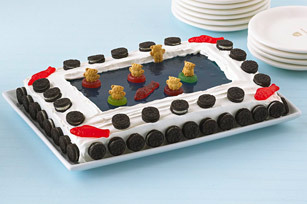 Decorate graham snacks with the colored icing to resemble baseball players; arrange on top of cake. Refrigerate up to 2 hours before serving. Store leftover cake in refrigerator. 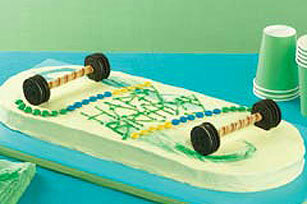 Cooking Know-HowMake sure the cake is completely cooled before frosting. A warm cake can cause the frosting to soften or melt.